This article first appeared in the Wells Journal on 9 January 2014. In the deepest, darkest days of winter, it is not uncommon to crave large helpings of a warming slow-cooked casserole, a rich, meaty pie or a satisfying steamed pudding smothered in hot custard. There are times though when it’s not heavy, stodgy comfort food my body yearns for. Instead I need something light, crunchy and zingy; a fresh and healthy dish to transport my head to more sunshiny climes. While this salad is comprised for the main part of seasonal winter produce, it successfully delivers a taste of summer, as well as providing a much-needed alternative use for those seemingly uninspiring ingredients filling our veggie boxes week after week at this time of year. 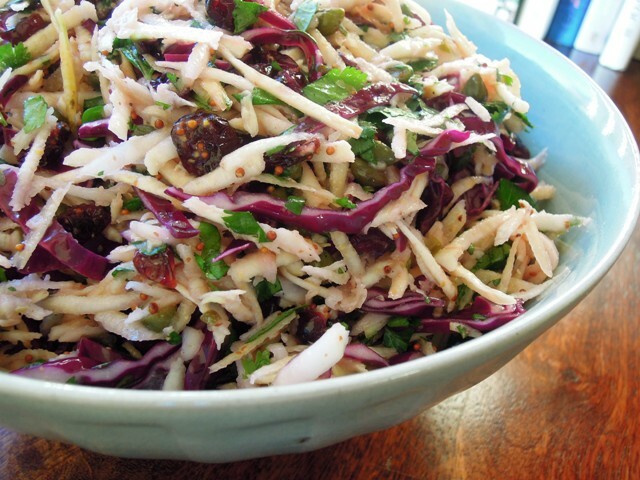 Based on a Yotam Ottolenghi recipe, this salad is extremely versatile and can be used with just about any root vegetable or cabbage. All the vegetables are served raw, either grated or finely shredded, so it is very much like a winter coleslaw or remoulade. But it is the dressing that really elevates this salad, featuring generous handfuls of fresh herbs, lemon juice, salty capers, mustard, sour cherries, sultanas and a little sugar, for a superbly vibrant sweet and sour kick. I served it alongside a baked ham for our Boxing Day gathering and it went down a storm with family and friends. It’s also a very good accompaniment to simple grilled fish or chicken, or include it as part of a mezze. So next time you pull up yet another swede or parsnip from you veg box or allotment, don’t automatically boil it up or roast it. 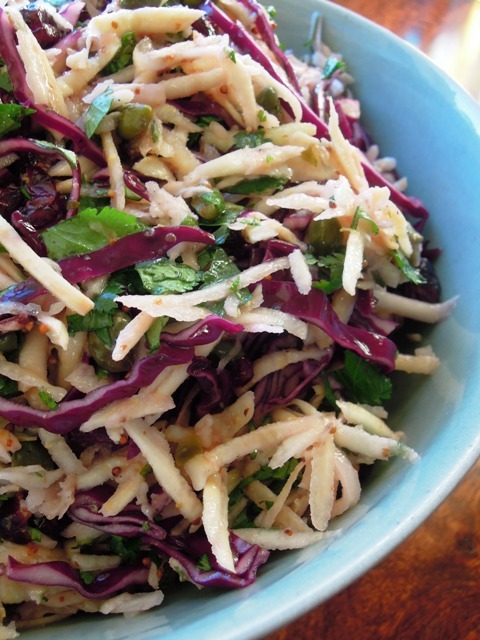 Instead, give this sweet and sour salad a go and bring your taste buds out of hibernation. Place all the shredded or grated vegetables in a large mixing bowl and simply add the rest of the ingredients. Use your hands to thoroughly combine everything to make sure the vegetables absorb all those flavours. Add salt and pepper to taste, and possibly a little more vinegar or sugar depending on how sweet or sour you like it. Leave the salad for an hour or so before serving to allow the flavours to develop. I always intentionally make too much, as I think it tastes even better the next day. As this salad features both fresh herbs and zingy lemon, I’m entering it into this month’s Cooking with Herbs hosted by Karen at Lavender & Lovage where the theme for January is Herbs & Citrus Fruits. It is also my offering for Extra Veg, a new challenge hosted by Fuss Free Flavours and Utterly Scrummy, encouraging us all to eat an extra portion of vegetables each day. With a big bowl of this in your fridge, there’s no excuse to snack on the bad stuff when you get the munchies. Since it’s such an unbelievably healthy bowful of goodness, I’ve got to share it with Four Seasons Food (hosted by Eat Your Veg and Delicieux), where the theme this month is Virtuous Food. And finally I’m also entering this salad into the Fabulous Fusion Food challenge, hosted by by the very talented Deena Kakaya. Thanks Deena – the dressing is truly delicious. Will link up with Fab Fusion Food right away! I just love this veggie winter salad and think Vanesther Rees is incredibly clever to come up with such ingredients for both the salad and the dressing, and thanks to Ytam Ottolenghi for giving her inspiration. My husband was impressed too. It’s marvellous to have such a salad during these winter months. I love this type of dressing with these vegetables. It’s so much nicer than a creamy dressing. Thanks Corina. Creamy dressings do have their place. I rather like a good celeriac remoulade for instance or a Caesar salad. But this dressing is perfect when I want to feel healthy inside and out – it’s just so fresh and zingy. Looks delicious Vanesther. I’m craving crunchy, zingy winter salads like this lots too at the moment – in between my pie fix! Thanks Andrea. Oh yes, a pie would actually go down rather well right now! I haven’t actually tried barberries but I understand they have a tart flavour so I think they would probably work rather well. Let me know how it turns out! I must get hold of some. Where do you get yours? If you live in London – Green Valley off the Edgware Road should stock them – I love that shop – or the Middle East shops by the fruit and veg market on the North End Road – the Fulham Rd end. Or if you live out of town you can buy them online from Ottolenghi http://www.ottolenghi.co.uk/pantry/dried-fruit-nuts/dried-barberries-shop £2.85 a bag. Good luck. Your salad looks like it would make a good, crunchy and seasonal topping for jacket potatoes – and I’m volunteering to try it out for you! Ooo, this salad sounds delish! Just got to track down some sour cherries so I can give it a go. Ooh yes, this sounds zingy and delicious – great idea. Not sure where you’d get fresh coriander and mint at this time of year, but my chives are coming up. I so need a salad like this to tickle my taste buds! To be honest I hadn’t thought of using all those winter roots in a raw salad like this but I really should have. And the dressing sounds sublime. A very ‘Virtuous’ feast indeed for Four Seasons Food, thanks so much for linking up.